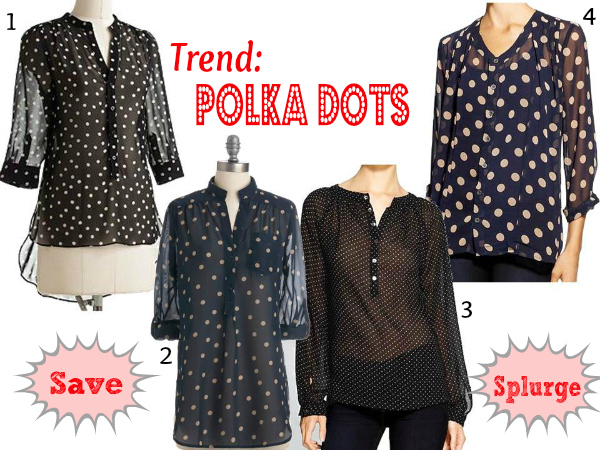 There is one trend that I can't help but love - the Polka Dot trend. I'm not sure if you could really call it a trend since it's be around forever and kids to elderly woman wear it. Just the other day I was sitting in a meeting and an older (than me) lady (I say this lightly as she was probably late 50s) was wearing a polka dot shirt and looked really nice and on trend. But when you mix the cutesy polka dots with a sheer shirt you can't help but feel a touch of sass with the shirt. I recently added the LC Lauren Conrad polka dot shirt to my closet and find my self constantly wanting to reach for it so I thought I would give you a "Save vs Splurge" on one of my favorite new pieces. Are you a fan of the sheer polka dot trend? Polka-dots go with everything and seem so timeless! I love them :) #4 is so cute and would look great with some jeans or tucked into a pencil skirt. Thanks for these suggestions....I'm also a big fan of polka dots but not much luck finding THE ONE!! !